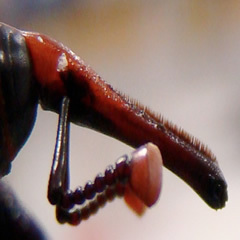 An adult of this coleopterous, also known as red palm weevil, has an elongated and ovoid body, its colours vary from rusty brown to black, and its legs have the same colour of its body. It is from 19 to 42mm long and from 8 to 16mm wide. It has some changeable-distributed black and circular spots in the pronotum. The rostrum is elongated and downwards bent. Its colours vary from rusty brown to black. The sexual diphormism is evident, since the males have, at the end, an erected crest which the females do not have (Wattanapongsiri, 1966). 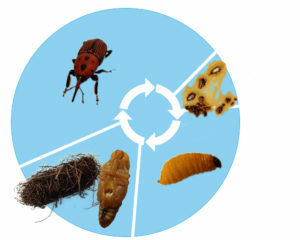 Its biological cycle has four phases: egg, larva, pupae and adult, as well as nine larval phases (Martí­n-Molina et al., 2001). In the article published by Guerri-Agulló et al. (2010) there are images of the insect’s morphology made with Scanning Electron Microscopy. The female coleopterous lays its eggs in holes made with its rostrum. These holes are made in the base of the palm leaves petiole, on fresh tissue. Just one female can lay from 58 to 531 eggs (Wattanapongsiri, 1966). The eggs are whitish and yellowish. They are smoothing, brightly, cylindrical and rounded in the ends. The front end is narrower. When the eggs hatch, after 1-6 days of been laid, they become larvae, and they are 36-47mm long in the last phase and 15-19mm wide. Its cephalic capsule can be around 8-9mm long and 7-8mm wide (Wattanapongsiri, 1966; Faleiro, 2006). When the larve builds the cocoon, it gets closer to the external side of the palm trunk, the bark, so that the adult can leave it easily. In the development of this thesis, while we were studying palm trees infected by the red pal weevil because of its chewing, we simultaneously saw all the phases of the insect. Prior studies (Lepesme, 1947) claim that the R. ferrugineusis a polivoltine species (with several generations every year). The Rhynchophorus ferrugineus comes from the Southeast of Asia, where they feed themselves in coconut trees, Cocos nucifera (Faleiro, 2006). This pest, far from merely be found in its original area, has spread to Saudi Arabia, The United Arab Emirates, Oman (in the 80s), Iran, Egypt, Jordan, Israel, Palestine (in the 90s), Spain (in 1995), Italy (in 2004), Turkey, Greece, France, Cyprus (in 2006) Syria, CuraÃ§ao, Morocco, Portugal (in 2008) and USA (Boavida, 2008; EPPO 1999a, 1999b, 2006a, 2006b, 2006c, 2007a, 2007b, 2009a, 2009b, 2010). In its quick spread, the R. ferrugineus has infected 20 kinds of palm trees, such as the Canary palm tree, P. canariensis, and the date palm trees, P. dactylifera (Barranco et al., 2000). The systematic pruning made to the palm trees reduces the photosynthetic capacity of the plant, and therefore, causes a nutrient decrease, which results in a nutritional stress because of the move of the palm trunk reserves and the root system. The elimination of green leaves weaken the plant and it can cause an attack from pathogenic agents (Moya et al., 2005). The pruning releases kairomonas to the environment and it might attract possible plagues such as the R. ferrugineus. In the fresh tissues of the coconut palm, C. nucifera, some substances which attract the R. ferrugineus have been found (Gunawardena et al., 1998). That is the reason why releasing these substances to the environment might favour the palm infection by such insect. 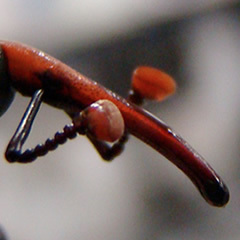 The same synthetic substances are used as appealing baits for the traps used against this coleopterous (Gunawardena et al., 1998; Abbas et al., 2006). The damage caused by the pest, which can cause the palm’s death, is produced by the larva phase. The larve makes corridors inside the palm trunk and the leaves’ petiole while it is feeding itself from the vegetable tissue. In addition, the holes made when adults are feeding themselves or the females are laying the eggs, can be seen in the leaves’ sheath and petiole of the infected palm trees. Nowadays, the known damages of the R. ferrugineus in palm trees are these produced by the larvae’s feeding. However, another species of the same genus, the R. palmarum (Linnaeus, 1758), is also the vector of the phytopathogenic nematode Bursaphelenchus cocophilus, an agent causing the disease known as “red ring”, found in several species of tropic palm trees (such as the Cocos nucifera L. orElaeis guineensis Jacq.) (Sánchez and Cerda, 1994; Oehlschlager et al., 2002). The role of the R. ferrugineus as a vector of the phytopathogenic fungus Thielaviopsis paradoxa (Parra et al., 2003) has also been speculated. Due to these precedents, the R. ferrugineus might act in the future as a vector of any other phytopathogenic agent. But there are not data in this regard for the R. ferrugineus, although there are many examples of complex diseases/plagues with synergic effects among the involved agents (Agrios, 1997). Different kinds of methods to discriminate among healthy palm trees and infested ones by the R. ferrugineus have been used, with changeable success. They can be divided in visual, physical and chemical methods. The visual method is based on observations carried out by the proper technical support in the top of the plant. An infected palm tree by the R. ferrugineus with visual symptoms such as the drying of central leaves or the fall of external leaves, mean its death is irreversible (Esteban-Durán, 1998). It is due to the effectiveness of the control measures in this condition. Therefore, finding an early detection method of the R. ferrugineus is necessary. It must allow taking efficient control measures when the survival of the palm tree has not been compromised. The physical methods are based on the detection of the sound produced by the larvae’s feeding (Al-Manie and Alkanhal, 2004; Soroker et al., 2004; Faleiro, 2006; Mankin et al., 2008; Pinhas et al., 2008; Ilyas et al., 2009; Gutiérrez et al., 2010; Siriwardena et al., 2010). These methods allow detecting an infected palm tree before its death is unavoidable. The physical methods are still under research, even though its practical use in the field is advancing considerably. The chemical method is based on the detection of the smell coming from the fermenting palm tree tissues caused by the larvae’s feeding, whose intestine contains a wide microbiota (Faleiro, 2006; Khiyami and Alyamani, 2008). A variation in this method, taking advantage of trained dogs, has been used in Israel in order to early detect infested palm trees by the pest (Nakash et al., 2000). However, its current use has not been described in the bibliography. Information taken of the PhD thesis “Biological control of the red palm weevil (Rhynchophorus ferrugineus) through the entomopathogenic fungus Beauveria bassiana” defended in the University of Alicante by Berenice Guerri Agulló, directed by Luis Vicente López Llorca, Pablo Barranco and Leticia Asensio. Abbas MST, Hanounik SB, Shahdad AS, Al-Bagham SA. 2006. Aggregationpheromonetraps, a majorcomponent of IPM strategyforthe red palmweevil, Rhynchophorus ferrugineus in date palms (Coleoptera: Curculionidae). Journal of Pest Science 79:69-73.Agrios GN. 1997. PlantPathology 5th edn. California: AcademicPress. 643 p.
Al-Manie MA, Alkanhal MI. 2004. 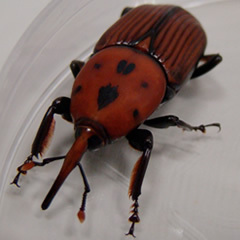 AcousticDetection of the Red Date Palm Weevil. Transactionsonengineering, computing and technology 2:209-212. Alonso-Zaragoza MA, Lyal CHC. 1999. A world catalogue of families and genera of Curculionoidea (Insecta: Coleoptera)(ExceptingScolytidae and Platypodidae). Barcelona: Entomopraxis. 315 p.
Barranco P, De la Peña JA, Cabello T. 1996a. El picudo rojo de las palmeras, Rhynchophorus ferrugineus (Olivier), nueva plaga en Europa. (Coleoptera, Curculionidae). PHYTOMA-España 76:36-40. Barranco P, De la Peña JA, Cabello T. 1996b. Un curculiónido tropical para la fauna europea, Rhynchophorus ferrugineus (Olivier, 1790), (Coleoptera, Curculionidae). Boletín de la Asociación Española de Entomología 20:257-258. Barranco P, De La Peña JA, Martín MM, Cabello T. 2000. Rango de hospedantes de Rhynchophorus ferrugineus (Olivier, 1790) y diámetro de la palmera hospedante (Coleoptera, Curculionidae). Boletín Sanidad Vegetal Plagas 26:73-78. Boavida C. 2008. Rhynchophorus ferrugineus (Olivier, 1790) (Coleoptera: Curculionoidea: Dryophthoridae), anexoticweevilrecentlyintroducedinto Portugal. Boletín de la SEA(42):425-426. Conselleriad’Agricultura i Pesca. 2006. Resolució de la consellerad’Agricultura i Pesca de 30 de novembre de 2006, per la qual es declara l’existència de tres focus de l’insecteanomenat «becutvermell de la palmera» (Rhynchophorus ferrugineus) a l’illa de Mallorca i s’estableixen les mesures per evitar-ne la difusió. BOIB 178:20-22. Diari Oficial de la Generalitat de Catalunya. 2006. ARP/343/2006, de 3 de julio, por la que se declara la existencia oficial en Cataluña de la plaga del gorgojo rojo de la palmera Rhynchophorus ferrugineus (Olivier, 1790), y se califica de utilidad pública la prevención y la lucha contra esta plaga. In: Consejería de Agricultura Ganadería y Pesca, editor. Barcelona. pp 30422-30423. Diari Oficial de la Generalitat Valenciana. 2004. ORDEN de 24 de febrero de 2004, de la Conselleria de Agricultura, Pesca y Alimentación, por la cual se declara la existencia oficial de la plaga Rhynchophorus ferrugineus (Olivier, 1790) en la Comunidad Valenciana, se califica de utilidad pública la lucha contra el género Rhynchophorus spp. y se establecen las medidas obligatorias para su erradicación y control. [2004/X2248]. In: Conselleria de Agricultura Pesca y Alimentación, editor. Valencia. pp 5149-5156. Diari Oficial de la Generalitat Valenciana. 2006. RESOLUCIÓN de 28 de agosto de 2006, de la Dirección General de Investigación, Desarrollo e Innovación Agropecuaria, por la que se declara la existencia de un foco de Rhynchophorus ferrugineus (Olivier, 1790), en el término municipal de Elche y se delimitan las áreas de protección y de especial vigilancia. In: Conselleria de Agricultura Pesca y Alimentación, editor. Valencia. pp 30693-30694. EPPO. 1999a. Firstreport of Rhynchophorus ferrugineus in Jordan. EPPO ReportingService 5:5-6. EPPO. 1999b. Firstreport of Rhynchophorus ferrugineus in Israel. EPPO ReportingService 7:4-5. EPPO. 2006a. DistributionMaps of QuarantinePestsforEurope. Rhynchophorus ferrugineus [En línea]. Accesible en: http://www.eppo.org/QUARANTINE/insects/Rhynchophorus_ferrugineus/RHYCFE_map.htm [Accedido el 21/06/11]. EPPO. 2006b. Firstreport of Rhynchophorus ferrugineus in Italy. EPPO ReportingService 1:2-3. EPPO. 2006c. First record of Rhynchophorus ferrugineus in France and Greece. EPPO ReportingService 11:4-5. EPPO. 2007b. Firstreport of Rhynchophorus ferrugineus in Turkey. EPPO ReportingService 1:2. EPPO. 2008. Rhynchophorus ferrugineus. Data sheetsonquarantinepests. EPPO Bulletin 38:55-59. EPPO. 2009a. First record of Rhynchophorus ferrugineus in Curaçao, NetherlandsAntilles. EPPO ReportingService 1:2. EPPO. 2009b. First record of Rhynchophorus ferrugineus in Morocco. EPPO ReportingService 1:2. EPPO. 2010. First record of Rhynchophorus ferrugineus in the USA. EPPO ReportingService 10:3. Esteban-Durán J, Yela JL, Beitia-Crespo F, Jiménez-Álvarez A. 1998. Biología del curculiónido ferruginoso de las palmeras Rhynchophorus ferrugineus (Olivier) en laboratorio y campo: ciclo en cautividad, peculiaridades biológicas en su zona de introducción en España y métodos biológicos de detacción y posible control (Coleoptera: Curculionidae: Rhynchophorinae). Boletín de Sanidad Vegetal – Plagas 24:737-748. Faleiro JR. 2006. A review of theissues and management of the red palmweevilRhynchophorus ferrugineus (Coleoptera: Rhynchophoridae) in coconut and date palmduringthelastonehundredyears. International Journal of Tropical InsectScience 26(3):135-154. Gunawardena NE, Kern F, Janssen E, Meegoda H, Schafer D, Vostrowsky O, Bestmann HJ. 1998. Host attractantsfor red weevil, Rhynchophorus ferrugineus: identification, electrophysiologicalactivity, and laboratorybioassay. Journal of ChemicalEcology 24 (3):425-437. Güerri-Agulló B, Gómez-Vidal S, Asensio L, Barranco P, Lopez-Llorca LV. 2010. Infection of the red palmweevil (Rhynchophorus ferrugineus) bythe entomopathogenic fungus Beauveria bassiana: a SEM study. Microscopyresearch and technique 73: 714-725. Güerri-Agulló B, López-Follana R, Asensio L, Barranco P, Lopez-Llorca LV. 2011. Use of a solidformulation of beauveria bassiana forbiocontrol of the red palmweevil (Rhynchophorus ferrugineus) (Coleoptera: Dryophthoridae) underfieldconditions in SE Spain. Florida Entomologist 94(4): 737-747. Gutiérrez A, Ruiz V, Moltó E, Tapia G, Téllez MM. 2010. Development of a bioacoustic sensor fortheearlydetection of Red Palm Weevil (Rhynchophorus ferrugineus Olivier). CropProtection 29(7):617-676. Ilyas P, Ganchev T, Kontodimas D. 2009. Onautomaticbioacousticdetection of pests: The cases of Rhynchophorus ferrugineus and sitophilusoryzae. Journal of EconomicEntomology 102(4):1681-1690. Khiyami M, Alyamani E. 2008. Aerobic and facultativeanaerobic bacteria fromgut of red palmweevil (Rhynchophorus ferrugineus). AfricanJournal of Biotechnology 7(10):1432-1437. Lepesme P. 1947. Les insectes des palmiers. París: Paul Lechevalier. 904 p.
Mankin RW, Mizrach A, Hetzroni A, Levsky S, Nakache Y, Soroker V. 2008. Temporal and spectralfeatures of sounds of wood-boringbeetlelarvae: Identifiablepatterns of activityenableimproveddiscriminationfrombackgroundnoise. Florida Entomologist 91(2):241-248. Martín-Molina MM, Barranco P, Cabello T. 2001. Biometría del estado de larva de Rhynchophorus ferrugineus (Olivier, 1790) (Coleoptera: Curculionidae). Libro de Resúmenes de las XIX Jornadas de la Asociación Española de Entomología. Barcarrota (Badajoz):78. Moya B, Plumed J, Littardi C. 2005. La poda de las palmeras ornamentales. Biología, ecologíá y gestión. : Asociación Española de Arboricultura. 266 p.
Nakash J, Osem Y, Kehat M. 2000. 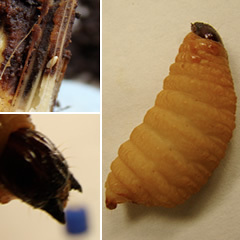 A Suggestionto Use DogsforDetecting Red Palm Weevil (Rhynchophorus ferrugineus) Infestation in Date Palms in Israel. Phytoparasitica 28 (2):153-155. Oehlschlager AC, Chinchilla C, Castillo G, Gonzalez L. 2002. Control of Red Ring DiseasebyMassTrapping of Rhynchophorus palmarum (Coleoptera: Curculionidae). Florida Entomologist 85 (3):507-513. Parra D, Morillo F, Sánchez P, Pineda J, Guerra J. 2003. Presencia de ThielaviopsisparadoxaDe SeynesHöhn en el tubo digestivo de Rhynchophorus palmarum Linneo (Coleoptera: Curculionidae). Entomotropica 18(1):49-55. Pinhas J, Soroker V, Hetzroni A, Mizrach A, Teicher M, Goldberger J. 2008. Automaticacousticdetection of the red palmweevil. Computers and Electronics in Agriculture 63(2):131-139. Sánchez PA, Cerda H. 1994. El complejo Rhynchophorus palmarum (L) (Coleoptera: Curculionidae)-Bursaphelenchuscocophilus (Cobb) (Tylenchida: Aphelenchoididae), en palmeras. Boletín de Entomología Venezolana 8(1):1-18. Siriwardena KAP, Fernando LCP, Nanayakkara N, Perera KFG, Kumara ADNT, Nanayakkara T. 2010. Portable acousticdevicefordetection of coconutpalmsinfestedbyRynchophorus ferrugineus (Coleoptera: Curculionidae). CropProtection 29(1):25-29. Soroker V, Nakache Y, Landau U, Mizrach A, Hetzroni A, Gerling D. 2004. Utilization of SoundingMethodologytoDetectInfestationbyRhynchophorus ferrugineuson Palm Offshoots. Phytoparasitica 32 (1):6-8. Wattanapongsiri A. 1966. A revision of the genera Rhynchophorus and Dynamis (Coleoptera: Curculionidae). Bangkok (Thailand): Departament of AgricultureScienceBulletin. 328 p.